When I was in high school and college, my family took me to Florida for just about every school break. By Florida, I mean Orlando. More specifically, Disney World and all the massive theme parks ever created. 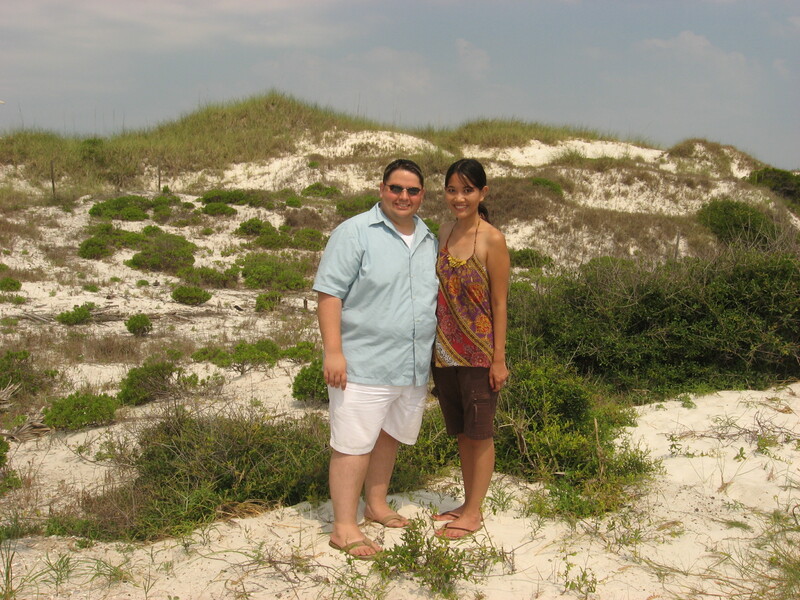 I also remember visiting the beaches in the Destin / Fort Walton area once or twice. We absolutely had lots of fun: celebrating Christmas at Epcot, strolling among the giant rockets at the Kennedy Space Center, and renting a house in Kissimmee that had its own pool. Oh, and let’s not forget eating ramen noodle and Indonesian food that my family had cooked at home and packed meticulously to ensure that it would last us throughout our entire trip. Now that I’m married and have a new travel partner, a.k.a my lovely husband, I yearn to learn more about the history of a place and to discover nature’s beauty. I enjoy researching for the less obvious. Over the past few years, Johnny and I have slowly taken on the journey of finding the treasures of each U.S. state that we have visited. As is the case with the Sunshine State, we learned how rich Florida is in history, architecture, culture, and natural beauty. While the majority of the beaches in Florida are covered with smooth sand, piles of coquina rocks dot the shoreline along the Washington Oaks Gardens State Park. This rock formation is quite rare, as they are only found in significant amounts in New Zealand and the southern coast of the United States. The outcroppings, which contain many shells and potholes, are believed to have been formed from either a submerged offshore bar or from a beach ridge similar to the present barrier beach (see http://www.washingtonoaks.org). Washington Oaks Gardens State Park is located in Palm Coast, about half an hour drive south of St. Augustine. It is divided into two sections: the formal gardens by the Matanzas River, and the Atlantic coast where you will find the coquina formation. We suggest that you explore both sides of the park. Boneyard Beach on Big Talbot Island offers another unique scenery in Northeast Florida. Big Talbot is one of the last undeveloped barrier islands along the Atlantic coast. From the parking lot, we walked on a short trail surrounded by maritime hammock to get to a beach that is littered with salt-washed remnants of live oak and cedar trees that once grew near the shore. Big Talbot Island State Park makes for an easy day trip from the city of Jacksonville. The quiet small towns of Port St. Joe and Cape San Blas in Northwest Florida are blessed with powder sugar sand and beaches that have made it to the number one spot of Dr. Beach’s 2002 America’s Best Beach list. The northern tip of Cape San Blas is home to St. Joseph Peninsula State Park, which protects some of the nation’s highest dunes as well as some of the last remaining habitat of coastal sand pine scrub. To find out more about Port St. Joe and Cape San Blas, read my blog post on Florida’s Forgotten Coast. One of the things that we have learned from our travels is to always make time to visit the local state parks. We get to enjoy one-of-a-kind landscape for such an affordable price. Natural springs are abound in Central Florida, and in December of 2011 we had the opportunity to explore Weeki Wachee, a spring that runs so deep that it supposedly has a bottom that has not been found. I wrote a separate blog post about the Weeki Wachee State Park, since it also features the not-to-be-missed mermaid underwater shows. The park also offers a river boat cruise down the Weeki Wachee River, and if you’re lucky you might encounter manatees swimming in the crystal clear water. This mission dates back to some of the earliest Spanish settlers in Florida, and represents the founding of the city of St. Augustine. On September 8, 1565, Pedro Menendez de Aviles landed and proclaimed this site for Spain and the Catholic Church. It was on these grounds that Fr. Lopez, chaplain of Menendez’s expedition, would celebrate the first parish Mass and begin the work at America’s first Mission. 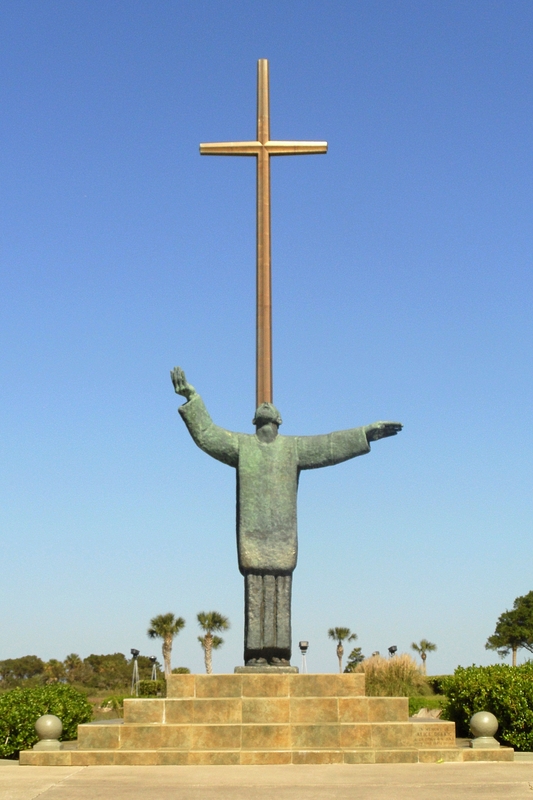 The Great Cross, made of stainless steel and rises 280 ft high, was dedicated in 1966, in celebration of the four hundredth anniversary of the Mission of Nombre de Dios and the City of St. Augustine. Bonnet House is nestled among the high rises of Fort Lauderdale beach. Ponds with bonnet water lilies and tropical gardens surround this 1921 plantation-style waterfront home. Upon our arrival, we were greeted by friendly volunteers who gladly gave us a private tour of the property on board a golf cart. We saw squirrel monkeys swinging from tree to tree, and meandered through five distinct ecosystems which include mangrove wetlands and a freshwater slough. The site in itself has a history that dates back thousands of years ago. A shell midden left by the Tequesta people indicates human activity from around 2,000 B.C. The Bonnet House Museum and Gardens is listed on the National Register of Historic places. Amid the hustle and bustle of one of the most popular beach destinations in the world stood a solemn reminder to one of the world’s worst tragedies. While thousands of tourists flocked to South Beach, we encountered hardly anyone at the Holocaust Memorial, which was dedicated in February of 1990. 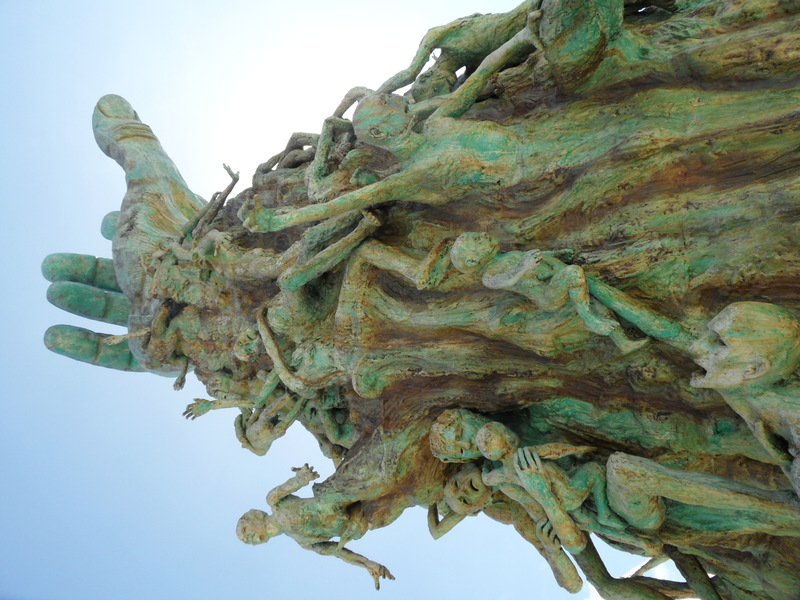 A giant outstretched arm, tattooed with a number from Auschwitz, is one of the many sculptures portraying the despair of the dying. There is a garden that is composed of a lily pond, an arbor covered with flowers, and a plaza made out of Jerusalem stone. We walked through a tunnel, and read some of the victims’ names that are etched on the black granite Memorial Wall. To anyone who is visiting the Miami Beach area, we highly recommend that you take the time to visit this moving tribute to those who were persecuted during the Holocaust. Miami strikes a chord with me because of its tropical scenery. Based on my numerous visits to South Florida, I have observed that there’s no other place that is as stunning as the Coral Gables area. It is lush, serene, and filled with historic architecture. 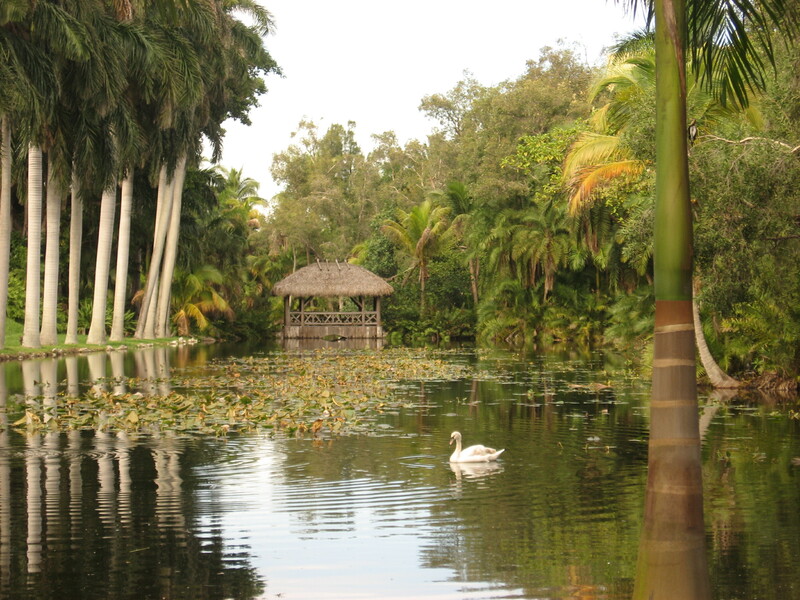 It is home to the Vizcaya Museum, the Biltmore Hotel, and the Fairchild Garden. 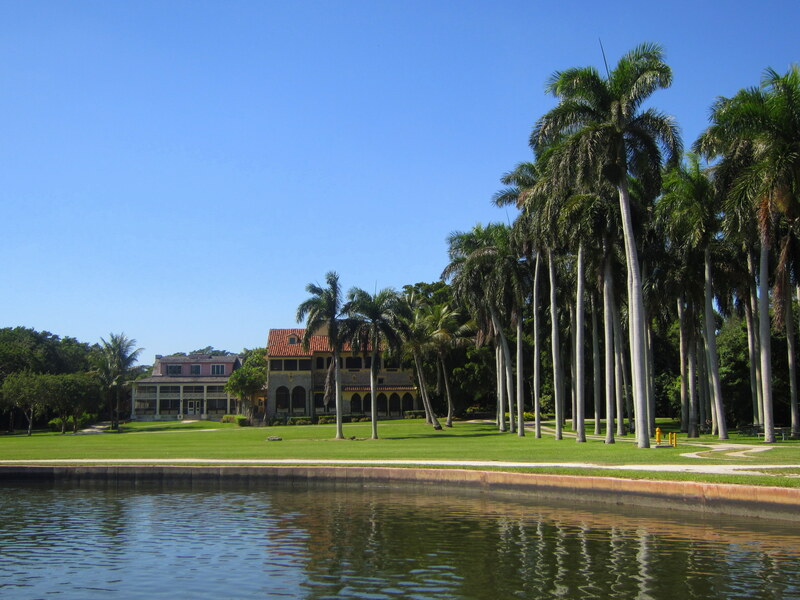 However, it is not until my fifth visit to Miami that I discovered the Deering Estate at Cutler, just south of Coral Gables. The estate was home to Charles Deering, the older brother of James Deering who built the Vizcaya. Unlike the ornate and Italian-style Vizcaya, Deering Estate has an understated charm and is off-the-beaten path. But don’t get me wrong. The views of the perfectly-spaced palm trees along the dock at the Biscayne Bay is simply breathtaking (see my first picture in this post). During our visit, we were lucky enough to watch 3 manatees play out in the shallow waters by the bay. The property itself consists of a three-floor wooden house built in 1900, known as the Richmond Cottage, and a three-floor stone mansion. The grounds include what is thought to be the largest virgin coastal tropical hardwood hammock in the continental United States. Key Largo is the uppermost island of the Florida Keys archipelago. To the northwest of the island lies the Everglades, a region of subtropical wetlands that begins near Orlando with the Kissimmee River, and flows southward to the Florida Bay. While we were in Key Largo, we took an ecology boat tour that allowed us to take a closer look at the southern portion of the Everglades. 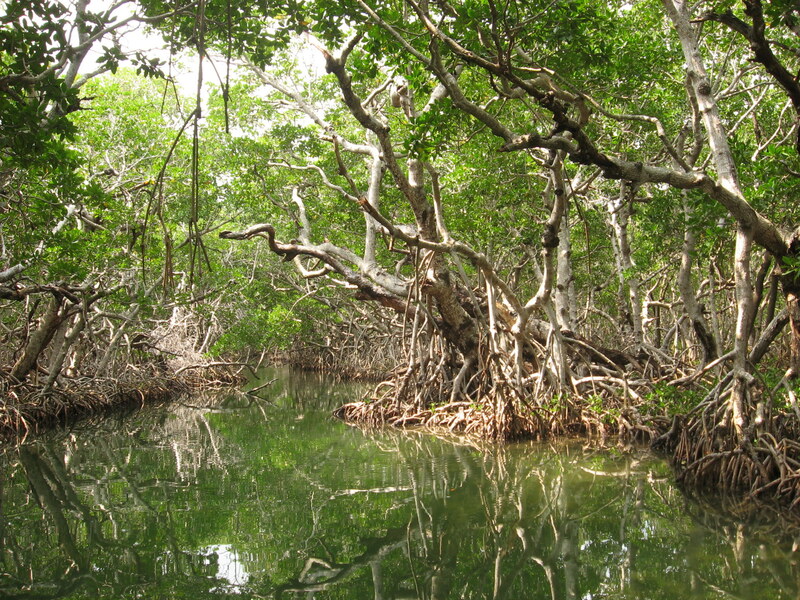 We sailed across the Florida Bay, and made our way into narrow channels surrounded by thick mangroves. One of these deep, dark recesses is dubbed the Hemingway’s Pass, a spot that National Geographic considers to be “the prettiest area in the Everglades.” If you are interested in taking one of these guided boat rides, contact Capt. Sterling’s Everglades Eco-Tours. 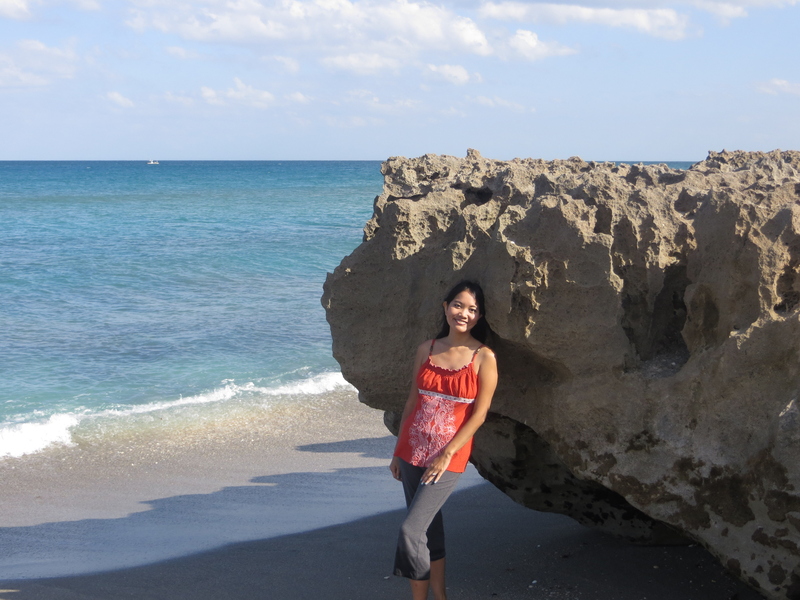 While dramatic shoreline along the U.S. Atlantic coast is commonly found in New England states, South Florida’s Jupiter Island has its own version of seaside cliffs in the form of Blowing Rocks. The Blowing Rocks Preserve contains the largest Anastasia limestone formation on the East Coast. This Anastasia formation, which is composed of sand, ancient coral reefs, and shells, is similar to the one found within North Florida’s Washington Oaks Gardens State Park. During high tide, waves would crash against these rocks and “blow” water up to 50 ft high. Towards the southern end of the preserve, waves have eroded the rocks into formations that are not much higher than the sand. On the opposite direction, you can have fun ducking in and out of caves created by the larger rocks. Have you ever been to Florida? What are your favorite spots to visit in the Sunshine State? Note: We have added this blog post to the #SundayTraveler, where you will find a collection of travel stories and recommendations from around the world. Love this post and the ideas for new places to explore in Florida! We visited Sanibel Island last year in September and loved it. Most of the island is preserved and there are no chains – everything is locally owned and charming. The calm waters of the gulf were also perfect for our young kids. I have never been to Southwest Florida. 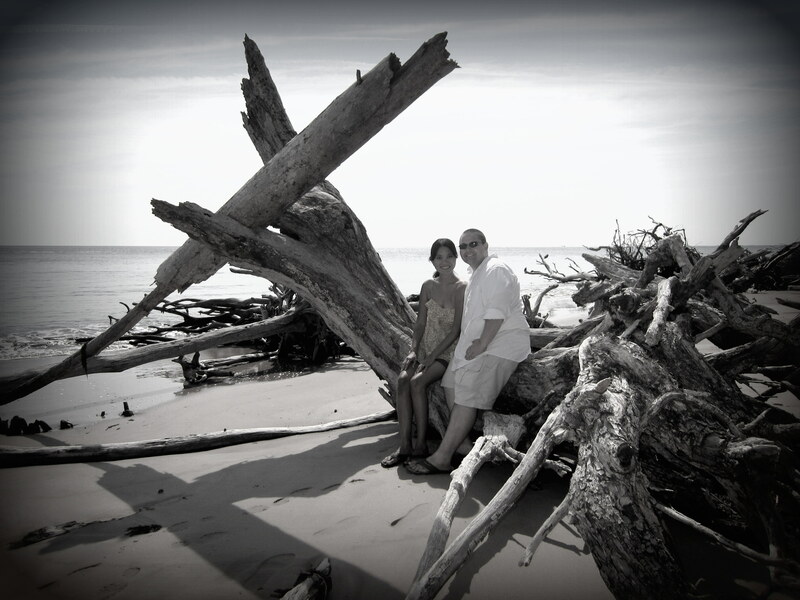 I have heard so many good things about Sanibel, and hopefully we will get to visit soon. Strangely I have never made it to Panama City, although everyone I know who lives in the Atlanta area always goes there for their beach trip. I love researching state parks, and that’s how I found most of these unique places. Amazing rock formation – strange you can only find this rock formation in New Zealand and the southern coast of the United States. So many sightseeing spots I haven’t known about. Love Deering Estate at Clutter, and that first photo. Thanks for linking up to the #SundayTraveler. 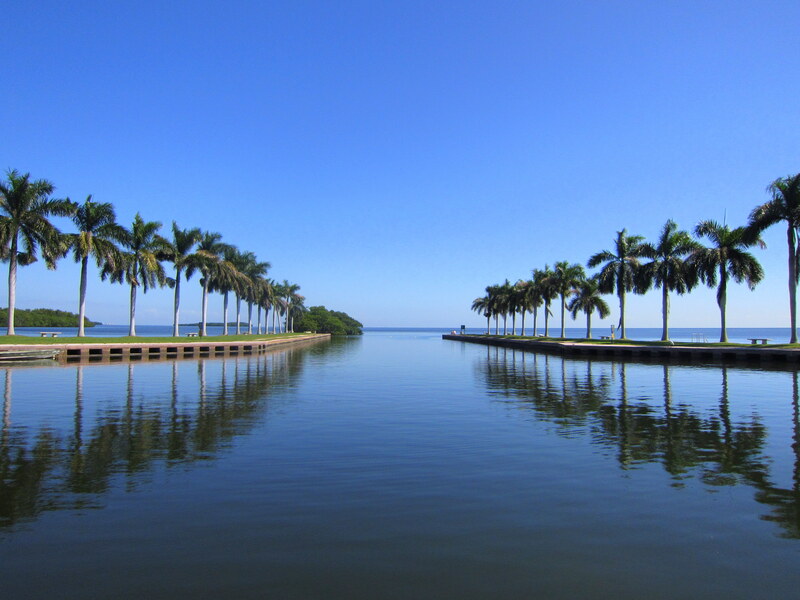 Not very many people know about Deering Estate, but it’s one of the most beautiful sites to visit in Miami. There are so many places to explore in Florida beyond the usual touristy spots. I hope you can make it back to Florida some time in the future. Never been to Florida before but I feel like it’s a must go: great inspiring post you wrote. I hope you’ll be able to visit Florida one day. Although it’s mostly known for Disney, I find that I love its off the beaten path beaches and beautiful springs. It really is such a wonderful memorial, and being there makes you feel like you’re a world away from crazy South Beach. Great post! I’ve really liked Florida the couple of times I’ve been there, but I will definitely be checking out some of these places on my next trip. Thanks for sharing and safe travels! We’ve been to Florida way too many times to escape the winter weather in Atlanta. Because of that, we take our time exploring parts of Florida that not many people know about. Thanks for stopping by our blog, and have a wonderful week! I am unfamiliar with many of these places and they really are hidden gems. What great scenery! Your pictures are beautiful. It’s sad to admit that we’ve gone to Florida for Disney or to go on cruise ships only and clearly have a lot more places to explore. We’re hoping to visit the Everglades NP and San Marco Island soon. Thanks for the inspiration! As many times as I’ve been to Florida, I have yet to visit the Everglades and Marco Island. Thank you for visiting our blog, and have a great week! I will admit that the vast majority of our trips to Florida have been restricted to just the theme parks. When I was a kid, though, I remember being totally in awe of Vizcaya. You’ve definitely shown that Florida has a lot more to offer than just Disney. I would love to visit that mangrove jungle, Weeki Wachee Springs, and Boneyard Beach. I also love Vizcaya, and would like to go there again next time I’m in Miami. I actually just learned that there are so many beautiful springs within an hour drive of Orlando. So families who travel to Orlando can enjoy the theme parks and a little bit of nature. I’ve been to Amelia Island, but I have to visit Sanibel and Siesta Key soon! Would love to watch sunset on Siesta Key. These are great ideas on other things to do in in Florida. The only times I’ve been to Florida is to visit Disneyland and Orlando. The state has so much more to offer. Adelina, I never knew about the places I wrote about on this post until just a few years ago. i really enjoyed visiting the theme parks with my family when I was younger. Nowadays I like to explore places that are not overrun with tourists. All these places look great! I’ve only ever visited Florida once and that was to al the theme parks but I want to go back and explore more. 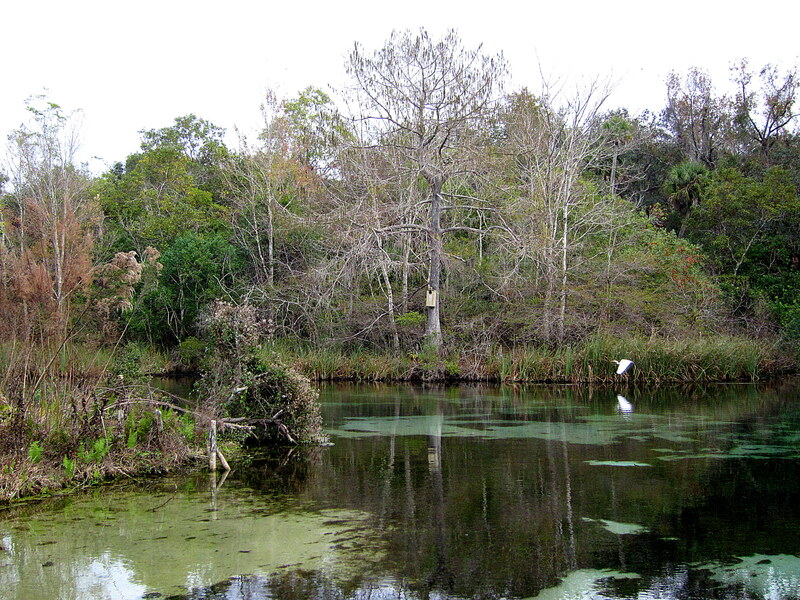 I want to take an ecological tour at the Everglades! I would love to do the airboat ride through the Everglades! I lived in Southwest Florida for years and now I’m back in the Sarasota/Bradenton area. I really enjoyed your photos. We don’t get over there very often. Thanks for stopping by, Linda! I hope to be able to visit beautiful Sarasota soon.